During those two days, June 26 to 27, the vast majority of McClellan's men had not seen much fighting. McClellan had sent 6,000 of them across the river to support Porter, but the remaining 69,000 Federal forces had remained nearly motionless. In part, it seems, they were nearly frozen with anticipation of what Rebel commander John Magruder would do. A thin line of 27,000 of Magruder's men was the only force standing in McClellan's way of marching into Richmond. Magruder had managed to keep the Federals off balance by firing artillery and then moving cannons around to make it appear that the Rebels had more firepower than they actually did. Magruder did the same with his troops, moving them in and out of wooded areas to create the illusion of more men. He even had his officers with the loudest voices hide in the woods and shout out commands to troops that did not exist. McClel-lan and the officers under his command were completely bamboozled. All the action against Porter would not have mattered if McClellan had not misjudged the strength of the enemy directly in front of him. On the evening of June 27, McClellan had even wired Secretary of War Edwin Stanton to inform him that he had been "attacked by greatly superior numbers" from both sides of the Chickahominy River, reports historian James McPherson. Although the Seven Days battles were not over yet, General McClellan was already thinking like a defeated commander. He had more men, had taken fewer casualties in two days than Lee, and could have pushed Magruder out of the way at any moment. The failure was McClellan's, but he blamed everyone and everything else. Four hours after his telegram to Stanton, the Union commander sent an angry, frustrated follow-up, recalled by James McPherson: "I have lost this battle because my force was too small. . . . The Government has not sustained this army. . . . If I save this army now, I tell you plainly that I owe no thanks to you or to any other persons in Washington. You have done your best to sacrifice this army." Fortunately for McClel-lan, perhaps, his full message never reached Stanton. A colonel in the telegraph office in Washington removed the last two lines from the general's telegram before handing the wire to Secretary Stanton. Robert E. Lee exploited the weaknesses of his Union opponent, General George McClellan, a cautious leader who was reluctant to take risks in war. Although Lee managed to eliminate the threat of Federal occupation of Richmond, the Southern war hero lost an estimated 8,700 soldiers, more than double the number of Union soldiers. 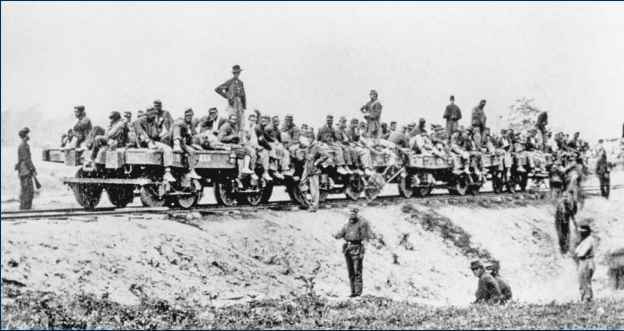 Above, injured Union soldiers from the Battle of Gaines' Mill sit on a flatbed railcar awaiting transport to the nearest hospital. June 28 was spent moving around forces on both sides. On June 29, with all his men south of the Chickahominy, Lee attacked. He hit McClellan's rear guard, commanded by Major General Edwin Vose Sumner's 2nd Corps. 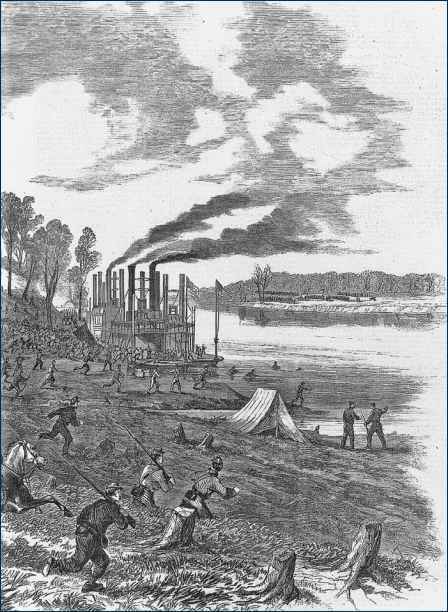 Sumner's forces were at Savage's Station, 3 miles (5 km) south of the river, along the Richmond & York River Railroad, due east of Richmond. A ragged fight broke out, and Lee suffered from poor maps, bad geography, strong Union resistance, and failures by Magruder, who did not attack with full strength. In addition, once again, Stonewall Jackson spent much of the day having his troops rebuild a bridge rather than send his men to the battle. The result was a Confederate assault that was disorganized and halfhearted. Sumner was able to hold his ground. In part, his men fought to protect a Union hospital near Savage's Station where several thousand Federal troops lay wounded and sick. And yet, McClellan ordered Sumner to abandon his positions, leaving the hospital's 2,500 occupants as prisoners of war.